For a long time, after the tragic events of the twentieth century, the skete’s cathedral stood in desolation. 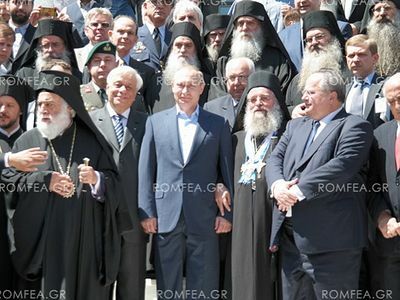 With the blessing of the primate of the Russian Orthodox Church, in view of preparations for the thousand-year anniversary of Russian monasticism on Athos, restoration work began in the skete a few years ago. The cathedral church was completely restored and painted for the festive jubilee. The painting of the church was undertaken by famous Russian artists, led by V. Nesterenko. Also wholly restored was the tower of St. Sava of Serbia, where the saint was tonsured in 1186, preserved buildings of the twelfth century and other of the skete’s structures. 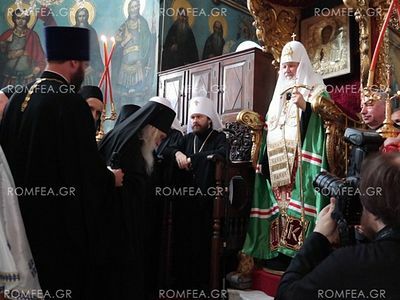 Leading a synaxis of hierarchs and clergy of the Russian Orthodox Church, Patriarch Kirill consecrated the renovated church in connection with the celebration ongoing on Mt. Athos in honor of the 1000 year anniversary of Russian Athonite monasticism. During the consecration the Patriarch, bishops, clergy and pilgrims held a procession around the church. 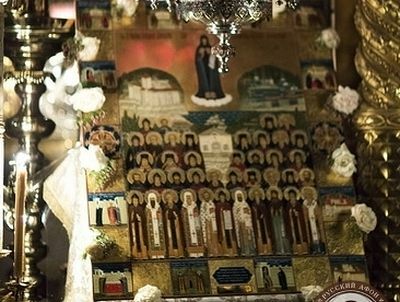 Then the Patriarch of Moscow led the synaxis in a festive Divine Liturgy, prayerfully glorifying the memory of All Russian Athonite Saints. In his homily His Holiness the Patriarch noted the special importance of the restoration of Old Russikon, where monks from Rus’ have struggled for 700 years. The primate recalled that when he first visited the skete in the 1970s, he was struck by the neglect. He underscored the necessity of restoring not only the walls, but of the whole spiritual life of the monastery, establishing a regular typicon for the services. In honor of the celebration the brothers of St. Panteleimon monastery presented the Patriarch a gift of a picture of Old Russikon by the artist V. Nesterenko. For his part, the primate of the Russian Orthodox Church gave the restored monastery an Iveron Icon of the Mother of God. After the festivities in the Old Russikon, Patriarch Kirill visited the skete and familiarized himself with the work undertaken for the anniversary of Russian Athos, after which he returned to St. Panteleimon Monastery, where together with the brothers of the monastery and numerous pilgrims he took part in a common trapeza. “Every time I’m on Mt. Athos it’s as if you’re touching the centuries-old podvig of people who devoted themselves to prayer, contemplation, and labor. Here this prayer is combined with the podvig of seclusion. I arrived here today with my companions, to celebrate with you the millennium of the Russian presence on the Holy Mountain as enshrined in the documentary sources,” he said.